When John Gidding's restablished the Isle of Wight as a premier spot for a music festival he also took an interest in the festivals of 1968, 1969 and 1970. He proposed a statue of Jimi Hendrix to acknowledge the Island's historical link with a music icon. In Freshwater Bay, Dr. Brian Hinton, curator of Dimbola Lodge the museum of Julia Margaret Cameron had built a permanent exhibition to the Isle of Wight Festivals of the late 60s and 70s. When the National Trust turned down the siting of a statue of Jimi Hendrix on Afton Down it was proposed to erect it facing Afton from the garden of Dimbola Lodge. John Gidding's made a substantial donation to have the statue made and erected at Dimbola. As soon as it was in situ, a voicerous group of Freshwater Bay residents began a campaign to have it torn down. In response to this campaign Ragamuffin Mike made this short film which stars Freshwater Bay resident and Jimi supporter Elizabeth Hutchings, her grand daughter Lily and Mike's daughter Laura. The film is scored with a beautiful song by Islander Martin White called You Taught Me. 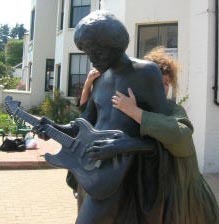 The planning committee of the Isle of Wight County Council turned over the objection to Jimi and the statue remains for everyone to enjoy. So visit the diamond Wight Island and Dimbola Lodge, take in its history of Victorian to modern day photography, its changing exhibitions, the permanent exhibition to Julia Margaret Cameron and the Island Festivals exhibition. Do stop for tea and cake in Dimbola's tea parlour and give Jimi a hug on your way out.